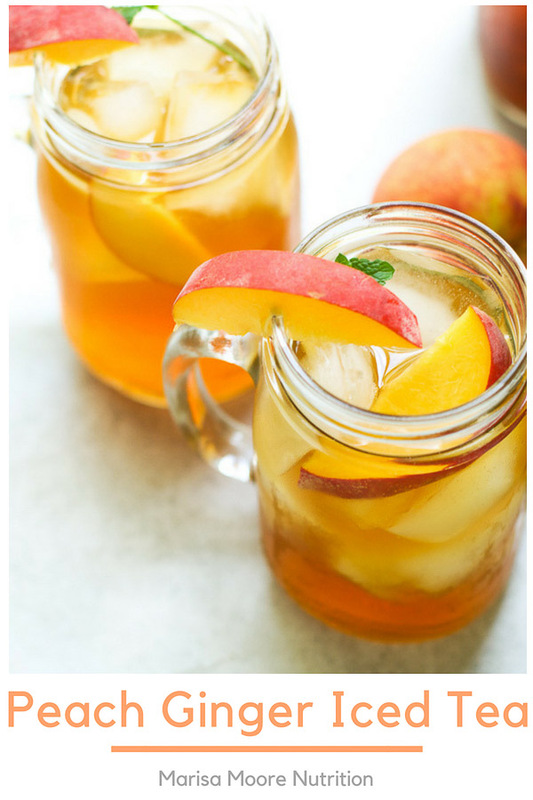 This honey-sweetened Peach Ginger Iced Tea is a refreshing way to stay hydrated this summer. 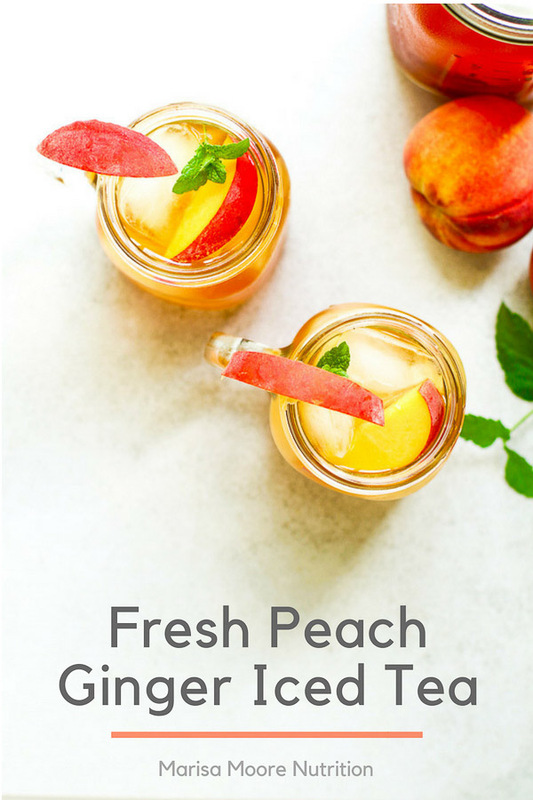 It’s bursting with fresh peach flavor but no refined sugar. 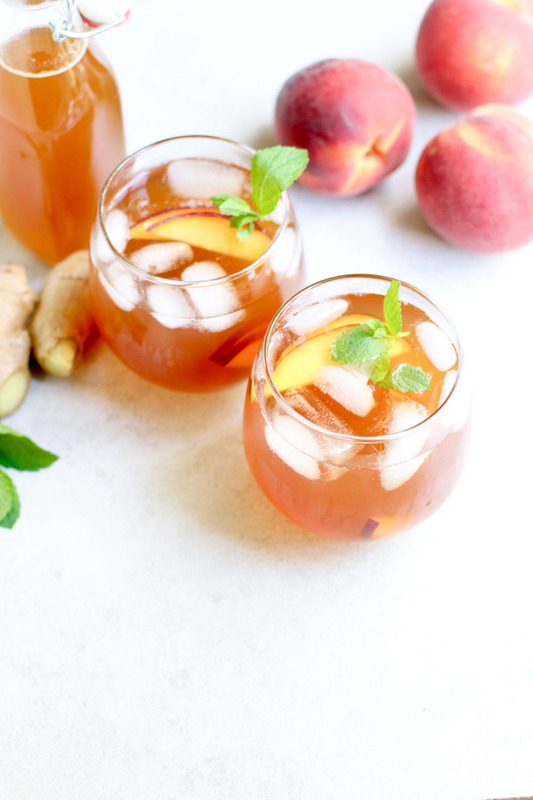 Today, I’m sharing this refreshing peach ginger mint iced tea as a throwback to my southern roots yet jazzed up with some of my favorite seasonal flavors. Growing up in Small Town, South Carolina, we always had “sweet tea” in the fridge. Sure, water will quench your thirst on a hot summer day but offering a glass of sweet tea is required in the unwritten rulebook of southern hospitality. We were never without it. My Grandma made it by simply steeping regular tea bags in hot water, adding plenty of sugar then more cold water before putting it in the fridge. When I say regular, I mean that old school orange pekoe and black tea none of the green or herbal teas I’m so used to now. This version of sweet tea was all I knew and how my family still makes it today. Though we’d sometimes have sweet tea mixed with lemonade, I never thought to try any other flavor combos. Back then simple sweet tea was a refreshing indulgence to be savored with friends and family over a meal or on the porch on long summer nights. Fast forward to my life here in Atlanta. I start every single day with hot tea, but rarely make a pitcher of iced tea anymore. In fact, my family says I’m not allowed to make the “sweet tea.” I’m told I don’t put enough sugar in the tea. Oh well… More tea for me! 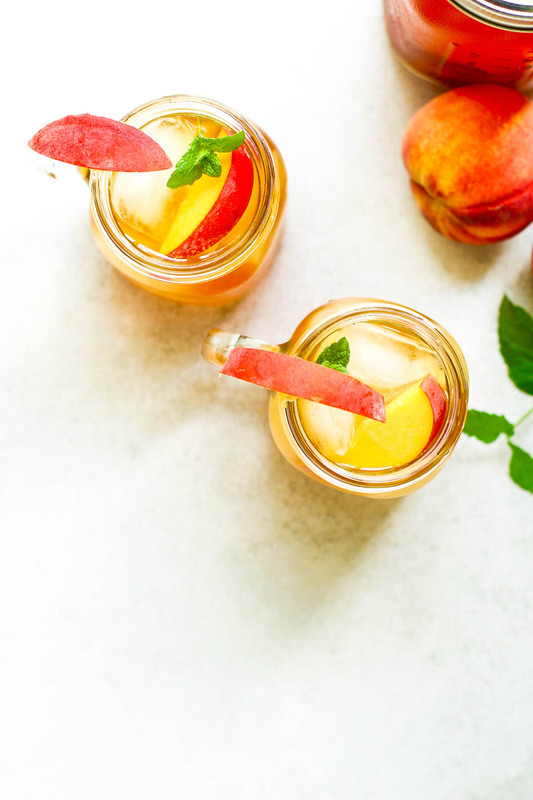 And since it’s summer and peak peach season here in Georgia, making this peach iced tea is a no-brainer. I swapped regular sugar for an infusion of fresh peaches with honey, a hint of freshly grated ginger, and fragrant fresh mint. 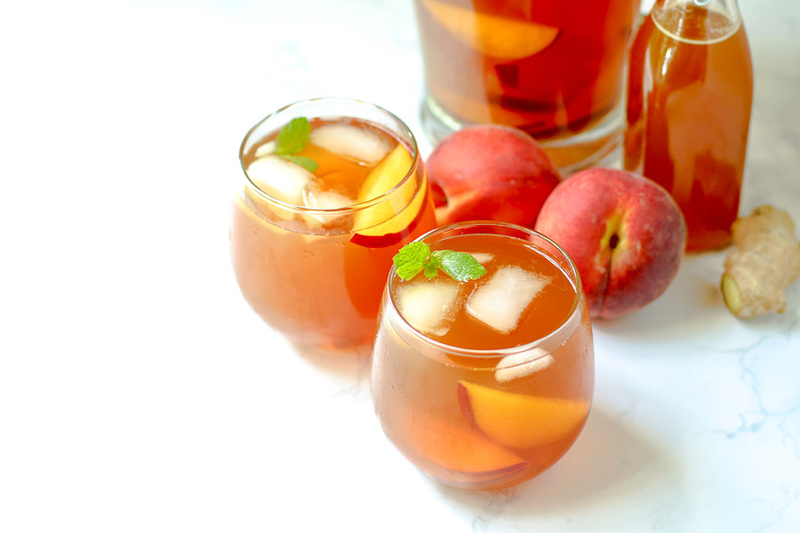 The honey peach syrup can be made ahead of time and kept in the fridge for up to a week. Flavor is the main reason you want to make this recipe, but if you have a hard time getting your daily water in, try tea. It’s a delicious way to stay hydrated that comes with potential health benefits. It’s just as hydrating as water, yet packs a ton of flavor. To get the most from it, make tea time a daily habit. Just 3-4 cups of black tea can deliver up to 400mg flavonoids, those active compounds found in tea that may help maintain a healthy heart. Ready to take a sip? Grab the easy recipe below and PIN it for later. Be sure to tag me on Instagram (@marisamoore) when you make it or let’s talk tea in the comments. Once your water boils, remove it from the heat. Add the tea bags and steep 3-5 minutes. (You can use the pot or a large, heat safe carafe or pitcher to steep). While the tea is warm, add the grated ginger and stir in the honey peach syrup. Add the cold water. Stir to combine. Refrigerate until cold, about 4 hours. Pour the tea into glasses over ice. Garnish with fresh peach slices and mint. To extract more mint flavor, muddle or crush the mint leaves in the glass before adding the tea. Serve.